Recht vielseitig einsetzbares und leicht bedienbares Programm, das über Ebenen/Folien/Layer arbeitet. Hochqualitative Lichteffekte und Texturen (allein davon mehr als achtzig), Farbverläufe, eigene Bilder und Texturen können übereinandergelegt (15 Blending-Methoden), die Reihenfolge und Intensität (pro Layer: Schärfe-, Unschärfebereich, Farbtemperatur, Sättigung, Helligkeit, Ausbelichtung, Kontrast, RGB) auch nachträglich verändert werden. Die Layer lassen sich unsichtbar machen oder löschen, als komplette Layer-Actions in Gruppen abspeichern, anderen Usern zur Verfügung stellen (Alayer Social ungetestet) und später mit anderen Aufnahmen anwenden. Der einzige Fehler dürfte sein, dass importierte Aufnahmen (also nicht solche, die mit den eingebauten Kameras geschossen wurden) zunächst in das Standardformat der App gequetscht werden (Lösung: solche Aufnahmen zuerst in das richtige Format bringen), an einer Lösung des Problems wird angeblich gearbeitet. (Test v. 5/’14.) Ein Zitat aus dem Store mit der offiziellen Produktbeschreibung folgt weiter unten in diesem Blogposting. TIPP! 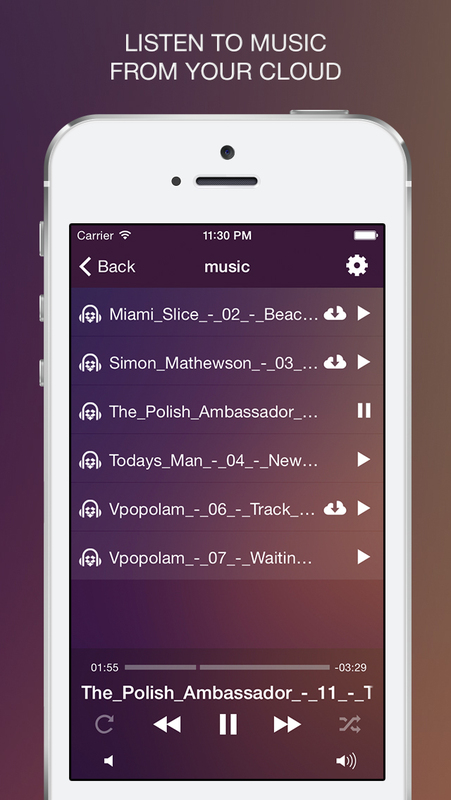 CloudPlayer Pro – music player of audio files from cloud storages (Universal, 10,1 MB, 3,99 €). iBox Remote File Access (Universal, 1,8 MB, ungetestet). Gekürztes Zitat aus dem Store: „Not enough space on your iPhone to store all your favorite movies, tv shows and music? No problem! Just keep everything on your computer and stream it any time you want right to your iOS device. Amazing! iBox enables any iOS device to connect wirelessly and directly to any Windows computer that is turned on, connected to the Internet and has the iBox Control Panel running. After downloading iBox, go to http://teliapp.com/ibox/ to download the iBox Control Panel for Windows and the iBox Manual to help you get set up. TOPTIPP! 2Do ist offenbar nur noch heute gratis statt 14,99 €. Details siehe Rossau-Blog vor einer Woche: Umfassende und hoch dekorierte Aufgabenverwaltung (Universal, Apple Watch). It’s an easy way to share your actions/creations on „Alayer Social“ or to download one from the other users. Alayer is the perfect image editing app with a streamlined workflow and powerful tools. Give new life to your photos with unlimited Layers. Add textures, lens flares, effects, lights leaks, gradients and color adjustments as unique Layers. All the layers are fully customizable. You can add your own textures. You can change the sharpness, hue, saturation and more to any textures to create infinite variety of images. Use any of the adjustment tools to enhance your images to perfection. Alayer Social is a beautiful and unique place where you can share your personal creations and actions. Alayer Social contains all the actions created by all the users. Be creative and get inspired by Alayer community. If you find an action, you would like to apply to your photo,just download and use it. All your downloaded actions are saved on the „Favorites“ category. Use the erase tool for more control over your textures. Erase any part of the textures to better fit your images. Alayer includes a variety of real and beautiful textures made by artists. A lot of lens flares, beautiful coloring effects, lots of lights leaks and gradients. All the textures are fully adjustable. We would like to thank Sirius-sdz for the amazing Texture Pack 1 & Texture Pack 2. With Alayer you can choose your Own Textures or other Images to Blend with your photo. Now you can clone/duplicate the photo you are working with, as a new Layer. You can save your workspace as an action on the „Favorites“ category. All your actions can be shared on „Alayer Social“ and ready to be downloaded by the other users. Add infinity of layers. You have total control over your layers. You can rotate, change the opacity, hide, move or delete any of the layers. Dieser Beitrag wurde unter Befristete Aktionen im App Store, iPhone, iPhone-Kamera, iPod touch abgelegt und mit Alayer, ios verschlagwortet. Setze ein Lesezeichen auf den Permalink.